“Aye, he’s strong, Milady, or he’d not have survived those dreadful wounds. And, he made it through the fever and the festering when I thought he wouldn’t. In truth, his wounds have all but healed. Sure, ’tis his soul that’s sorely damage. I fear he has lost all will, Milady, and all hope.” The butterfly helplessly fluttered about attempting to take flight, but to no avail. Noticing its broken wing, the child stood and walked determinedly toward the arched window. Morag pressed a handkerchief to her eyes. The child glanced at the women noting their deep empathy and the older woman’s uncommon display of emotion. With a new urgency she carefully picked up the butterfly and tenderly placed it on her open palm. Assessing the damaged wing she softly traced the broken wing with her tiny finger, and then gently blew upon it. Almost immediately she watched it spread both wings and capably soar skyward. A satisfied smile crossed her small face. “Oh no, Morag, we must prevent that by whatever measures need be taken!” The small child slipped past them and into the room with the ailing boy. Sensing a presence, he opened his eyes. A child’s face hovered inches away. Bright blue eyes met his, and long golden hair seemed to surround him. He frowned and closed his eyes, again, presuming she would leave, but a breath tickled his nose and his lids opened of their own accord. She stood there still, staring down at him. Irritated, he huffed and turned over to face the opposite wall. The small footsteps receded and he thought she’d left him at last, but, when he dared a peek, he saw her peering curiously from the other side of the bed. Uttering a disapproving snarl, he turned over, once more. “You haven’t the strength,” she taunted. Throwing aside the bed covers, he jerked upright, only to fall back on the pillows as his head spun. “Are you addle-minded, girl?” he growled. “And how is it you know who I am?” she demanded, placing her hands on her hips. “Why would that concern me?” he snarled. “But you have faltered,” she whispered. His eyes blazed and she hurriedly hopped off the bed, capably dancing out of his range and away from his fury. “Aye, well, don’t you think anyone might falter if they’d suffered this?” He pulled open his nightshirt to reveal a long purple gash that ran from nape to navel. The welted scar was raised and angry, but no angrier than the boy who possessed it. Tears brimmed in his eyes and he fought valiantly to stem them. “It will take longer,” she soothed. “Wounds of the heart always do.” He found himself relaxing and he now allowed her to prop the pillows behind him so he sat upright. Neither child heard the women approaching the door. “Aye, then best we leave her with him awhile longer,” Morag whispered, softly shutting the door. “So, Killian O’Brien, will you play the game with me?” asked the girl, settling on his bed, once more. “What type of game is it? A game for girls to play?” he sniffed. “Do not be so certain,” she said, lifting an eyebrow. “Aye, well, I lost my mother just months ago, so my grief is still fresh.” His eyebrows contracted at the memory of it. “But, how can you miss what you never had?” he asked, leaning forward. “You live with Morag the Wise Woman!” he blurted. “You’ve clearly won this round, for your plight is truly greater! She may be a noted healer, but she is a wretched old crone. She is wicked and miserable, and her potions are bitter! My father used to say she was older than dirt, even back when he was a child.” She giggled and he smiled back, liking the sound of her laugh. The smile felt foreign on his face. 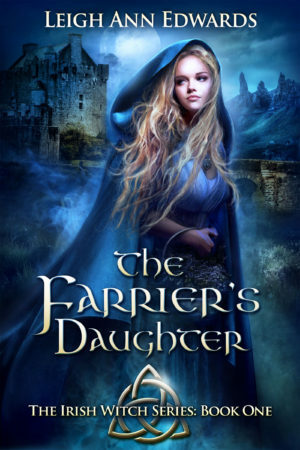 Did you know that The Farrier’s Daughter and many titles are available digitally from Tule's own bookstore? Check it out!